Editor’s Note: This post is a part of the #winosontheroad series. Over Yonderlust and d travels ’round are road tripping and exploring America through June 27. Be sure to check out all of the posts of life on the open road. Nebraska may have been flat, but it was beautiful. As I-80 goes on its epic straight track through Nebraska and Iowa, the scenery changes only slightly. Flat farms give way to fields with large crops growing in the early summer. Puffy white clouds mingle against a bright blue sky. And, the green bursts of vegetation below only add to the inherent beauty this part of the world offers. Sure, we may not have made any stops in Iowa en route to Chicago, but just looking out the window provided us with enough breathtaking moments to remind us America truly is one stunning country. BEAUTIFUL picture and wonderful post! I remember the wonderful scenes outside my car along the I-80 in Iowa… and then I decided to stop the car and race through a corn field in shorts. When I got back into my car, I was itchy itchy itchy and full of bugs. Thank you! 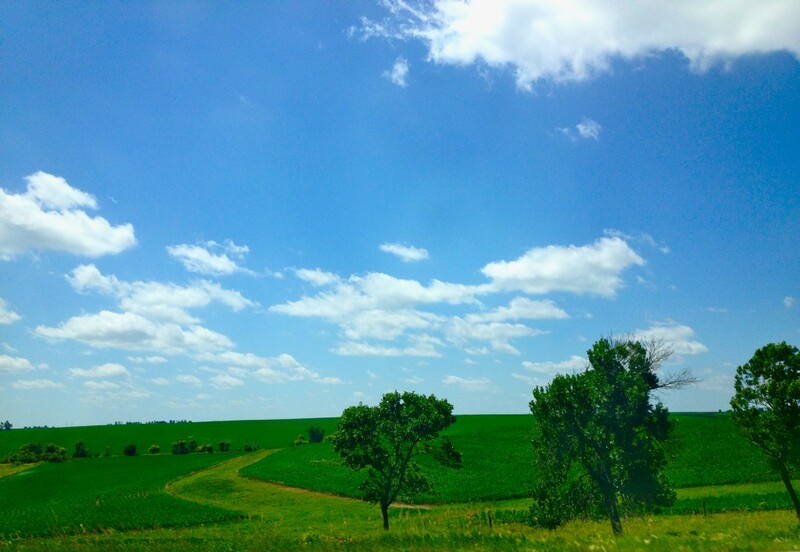 Although we didn’t actually stop anywhere in Iowa, we both really enjoyed the drive and the rolling hills and scenery. We discussed running through the fields but then opted to just keep going to Chicago. Next time!!! Although, even with your bug bites, I bet it was a lot of fun! So jealous of this trip, always something I have wanted to do – the great American road trip.